I turned on the TV in the morning when I got up to catch the news. I didn't have the luxury of having access to CNN or CNA or BBC for my daily dosage of morning news. I wanted to tune in to CCTV news anyway as I was following both the Ch1nese space expedition as well as the deep sea dive as the latter was captured in the image above. 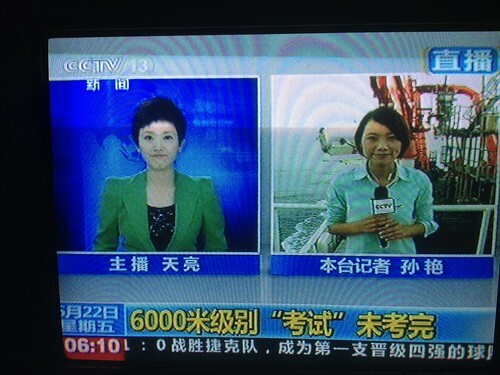 Then I noticed the anchorwoman's name. 天亮 which means daybreak. How apt for a morning news anchor!! Anyway, speaking of interesting names associated with their respective profession, I have a chauffeur in my D0ngguan office. 车停. Stop car. Yes. That is his name. I kid you not. It is almost as if their parents knew where they were destined to head since birth.